Last night we ate at a fabulous restaurant - Seasons 52 Fresh Grill. Their name is derived from their menu concept - each season they present a different menu (the Seasons part), and each week the chef presents different specials (that's the 52 part). The menu and concept was pretty unique and Marlaina and I were surprised to learn that they're a chain, with several locations throughout the country. We ordered three appetizers to share among the four of us - Grilled Spicy Tandoori Chicken Skewers with mango chutney and cucumber herb raita, Sonoma Goat Cheese Ravioli simmered in organic tomato broth with roasted garlic and fresh basil and Roasted Spinach Stuffed Silver Dollar Mushrooms mushrooms, tandoori chicken and ravioli. They were delicious - I really loved the ravioli and the mushroom was a close second. They went so quick, I couldn't get pictures. For dinner, there were so many delicious choices, it was hard to decide. Check out their winter menu to see for yourself. The most amazing thing? EVERYTHING on the menu is under 475 calories. Everything. They guarantee it. I didn't take pictures of what Marlaina and Greg had - they're pretty good friends at this point, but I can't force them to not eat like I can do with Ed. He's used to me taking pictures of good food and he knows not to pick up the fork until I get my shot! 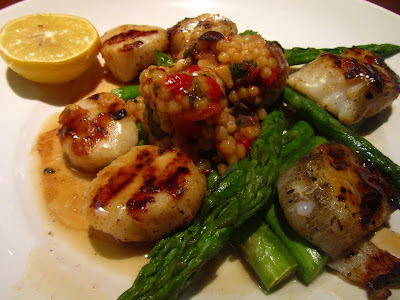 I had scallops last night, but since I don't have them very often I ordered them again. The description was too good to pass up - Caramalized Sea Scallops grilled and served with roasted asparagus and tomato-mushroom pearl pasta. Marlaina had the Grilled Boneless Rainbow Trout and Caramalized Sea Scallops with parsley new potatoes, roasted vegetables and broiled lemon. 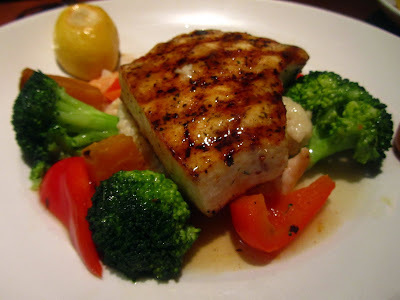 Ed had the Grilled Swordfish atop Yukon gold garlic mashed potatoes with a fresh vegetable mix. Greg had the Oak Grilled Filet Mignon with Yukon Gold garlic mashed potatoes, fresh vegetables and roasted mushrooms. It looked divine. 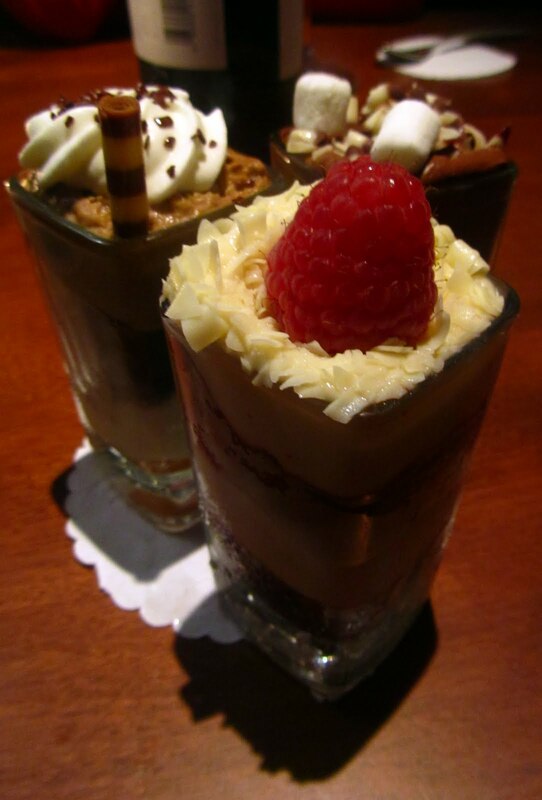 For dessert, we got an assortment of their Mini Indulgences - Classic Red Velvet Cake, Mocha Macchiato and Belgian Chocolate Rocky Road. Greg and Marlaina treated us to dinner (BEST TREAT ALL WEEK!) and it's definitely a place I'll be going again. 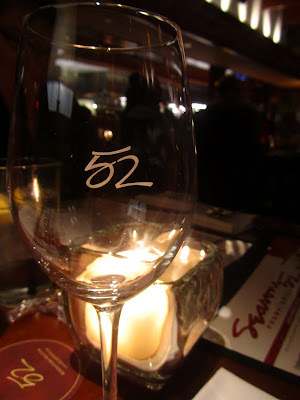 They have twenty-two locations, most in Florida, but others in cities we frequently visit, so I'll be looking out for another Seasons 52 in my future. We still have to taste Spring, Summer and Fall. 6 YEARS AGO: Down With O.P.P. 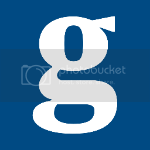 Stop writing about food, you're making me hungry every time. Salena, again you're killin me with those food pics...and that dessert...oh my..
Greggie: There's not much going on down here in the sunshine state - but that's not stopping us from going out to dinner! ELH: You need to treat yourself to dinner out! A small point of clarification, just so your readers don't think I throwback two entrees at time, even at 475 calories. I couldn't decide so I had the accompaniements of the trout with the scallops. Buti made a bad choice because the pasta and vegetables that you had that came with the scallops, that the chef labored, i am sure for days to get just right was way better. It was a great meal. I will find them another day, another state, another season. Apple Is My Life. I'm Living It To The Core. Light On My Feet. Literally.